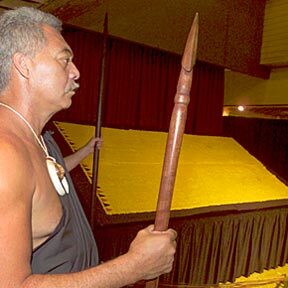 For the first time in 31 years, visitors to the Bishop Museum were able to view the skirt (pa'u) that was made for Kamehameha the Great's daughter, Nahienaena. She first wore it when she was 9 or 10 years old. It is made up of more than a million feathers. Originally, the skirt -- it is not a cape -- was 20 feet long, but upon Nahienaena's death it was cut in half and stitched together to make it 10 feet long. It was last displayed 31 years ago. Hinano Rosa stood guard. Starbulletin.com publishes online editions Monday through Sunday. New editions normally posted online between 2:00 and 5:00 a.m. Starbulletin.com publishes articles written by our staff and selected articles of particular interest to our readers. Entire contents of this Web site © copyright 2003 Honolulu Star-Bulletin. All rights reserved.